So much yarn, so little time. : Etsy relevancy - trying to become more relevant! Let me state from the start I am a long way from being an expert. This is just some notes on *MY* journey towards becoming more relevant since the recent changes. I'd be more than happy to hear your own thoughts - especially if your own investigation has reached entirely different conclusions. I'm trying to think like a buyer. When a buyer comes to Etsy, there are several ways to search. I think the main two ways are directly into the search bar, or by looking into categories. (Of course, we also hope to be found by people searching google - and that's a whole other story). The key here seems to be to use the right words at the beginning of your title, and the right pairs or groupings of words. By "right words" I mean you need to try to match what your buyer is searching for. 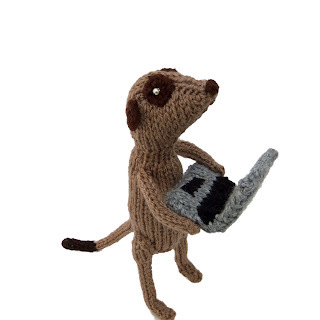 Etsy has changed the rules about "one tag, one word" because of relevancy, so if someone searches for "meerkat chef" and I have "Meerkat chef" at the beginning of my title, and as a tag, I will be more relevant than if I had "meerkat" as one tag and "chef" as another. Looking at my shop stats has shown me which of my various tags are being successfully used by people who have found my shop. I have seen people on the forums saying they're switching to using those tags more and more - but I'd say almost the opposite. I'm more interested in the people who are NOT yet finding me. Not surprisingly, many people find me using the term "star trek meerkat" but I think they probably already know about me. If I type "star trek meerkat" into the search bar it turns up 21 items - and guess what? They're all mine! What about those people who've never heard of my work, and don't even know a star trek meerkat exists - but who may well like one if they find it by accident? I brainstormed other possible searches for the same characters: star trek animals, scifi animal, science fiction animal, animal character and made sure I would be found on each of those searches by tweaking my tags and titles - and then on to the other meerkats. Yes, it's a long slow job. Now this opens up a whole new can of beans. Obviously I'd like to be found in as many different categories as possible, so I've been investigating where my kats might fit. Browsing through "Categories" with a particular meerkat in mind makes it clear how complex this all is! His top-level category could be "Art". This then gives 12 sub-categories, of which I think I could use "Fiber Art" or "Sculpture". "Fiber Art" gives 9 sub-sub categories - Art Doll, Knitting, and Soft Sculpture are all possibilities. If I'd gone with Sculpture, I could now select Animal or Fiber. On the other hand - maybe I don't like Art as a top level. Dolls and miniatures gives me even more possibilities to play with! Sub categories include animals, art doll, miniature, plush, soft sculpture, fantasy, anthropomorphic, figurines, geekery, weird, scifi - and it goes on. The BIG ISSUE here is that tags for categories and sub-categories must be exact. So even though it's now fine for me to use "scifi animal" as a tag, because a buyer might use that phrase in a search and therefore I'd be more relevant - that tag will NOT mean I show up in the scifi or animals SubCategory. To do that, I need separate tags for each sub cat - one for scifi and and one for animals. It also matters, apparently, whether you put animal or animals with an "s". Confused yet? Me too. So what I'm now trying to do is use some tags that focus on category searches and some that focus on "general" searches. As I said in the beginning - I'd love to hear your thoughts. I didn't even realise you could view your stats (Which I now have of course done and was interested in what I found out) Thanks for the tip. Useful information - I have been trying to tweak all my titles and tags over the past few days but you're right: it's a long painful process! Thanks for some great hints. I hadn't even thought to utilize the Art category ~ I had stuck all my items in the one category that seemed the best for my items. I've redone a bunch of my items now ~ it will be interesting to see how it effects my views. Thanks again! You're welcome - and that is exactly what I'd been doing, till I realised it was better to spread myself around. As long as you can justify being in a certain category, I think it's best to have a presence in several. I am trying to tweak my tags for different items so lets say I have 5 plushies, I try to make sure no matter which (correct)category is checked people will find one of mine there too. So I'm not entirely sure yet if it is better to put all the eggs in one basket or throw them at Etsy at a driveby.